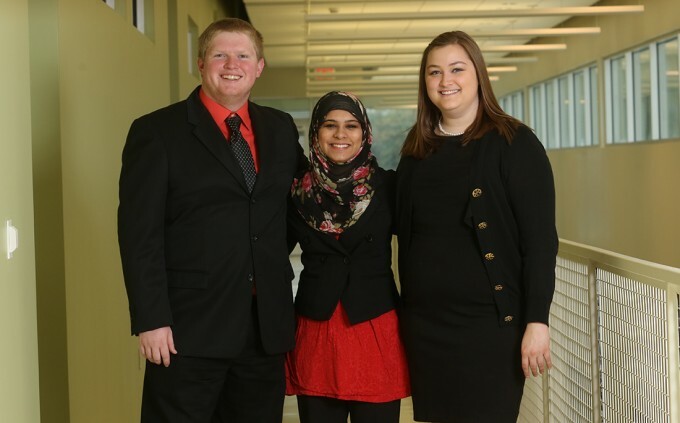 Bauer students (from left) Kirby Langseth, Shafaq Moosa, Meghan McDowell and Wes Bandini, (not pictured), were the first-ever North American team to bring home a championship in the 2012 Earthian Competition, where they competed against 500 colleges from across the world on sustainability issues. Four students from the C. T. Bauer College of Business at the University of Houston kicked off 2013 by winning a global competition and setting a record. The students were part of a team that claimed one of the top ten spots in the 2012 Earthian Competition, in turn becoming the first-ever North American team to win the global competition. The team, comprised of Wes Bandini, Shafaq Moosa, Kirby Langseth and Meghan McDowell, won the competition that encourages students from across the globe to implement sustainable thinking and to also stimulate the younger generation to step up as role models for sustainability. During the competition, the team had to identify an issue related to sustainability, critique the issue, and create a proposal for eliminating or managing the issue. The Bauer team identified the issue of carpooling to the University of Houston campus and came up with the solution to create a database of student locations to contact one another to carpool. “We are proud that because of our backgrounds in finance and supply chain management we were able to create a unique project,” Langseth added. This year, more than 500 colleges competed, with the Bauer student team coming out on top, winning $3,000 and a three-year engagement from Wipro and their partners in the area of sustainability.